How to Pair LIFX with IFTTT? The actual crux of enjoying the merits of Home Automation lies in optimising the home automation system installed at your place. With LIFX, you not only get a range of intelligent lighting solutions with some pre-defined scenes and schedules that cater to your every mood and occasion, but also lighting solutions that help you optimize your energy usage based on your daily lifestyle without compromising on your comfort. But won’t it be really exciting if your LIFX bulbs respond instantaneously to every external small event taking place around you? Like flash your living rooms lights when you have your favourite football team playing, or flash the LIFX bulbs upon receiving a notification or an e-mail. Yes this is very much possible with different IFTTT (If This Then That) recipes and guess what, they just get endless along with your imagination. So once you are done with setting-up your LIFX bulbs, take a look at the guide for How to Integrate your LIFX bulbs. To start with creating new scenes with your LIFX bulbs, make sure you have the latest version of the LIFX apps on your Android/iOS/Windows device. Your LIFX Bulbs have currently the version 2.0 firmware. If not, you can update it here. You have signed up with your own account at IFTTT.com. IFTTT.com has recently renamed its first mobile app from IFTTT to IF. This app features the same recipes and controls as seen on IFTTT.com. So, just link your LIFX Cloud Account with IFTTT and get started baking few recipes on either your laptops or smartphones. Step 1: Once you have connected your LIFX Bulbs to your Cloud Account, you get an access to IFTTT Integration, create your own new recipes or use the already published ones. However, note that in case you have just set up your LIFX Cloud Account go to cloud.lifx.com to request a link to reset or create your password. Step 2: Sing-in to your IFTTT.com or create a one after which you can activate the LIFX channel. Once done, IFTTT will ask you to authenticate your account details by asking you to enter your LIFX Cloud email and password. Step 3: Once the connection is established, you will now be able have access to all the bulbs and create recipes to help your control your LIFX bulbs. Upon selecting the trigger (IF this), you can chose the reciprocating action (Then That) you want (the LIFX bulbs) to perform. Let us take a look at one of the demo LIFX recipe showing possible controls. Step 1: Selection of lights will be unique to your account wherein you can select a single bulb, group of lights or even All Lights. After this, for the selected lights, you can adjust the Color, Brightness and the Transition Duration. Step 2: In case you are not using color enabled LIFX bulbs, you can change the white tone shades of the bulb. 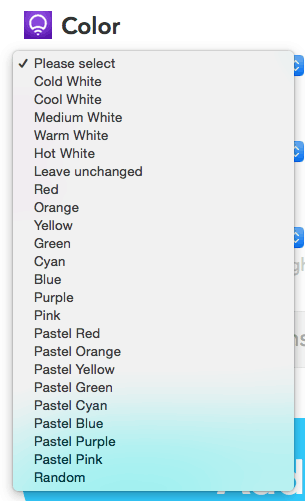 Whereas for color enabled LIFX bulbs, you get the facility to select the color of your choice. 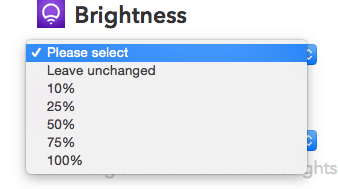 the “Leave Unchanged” option will keep the last shade the bulb was set to. Step 3: Just like the color, you can similarly adjust the Brightness of the bulbs to the desired levels. Here too, the “Leave Unchanged” option will set it to the pre-set state. Step 4: You can set different colors and the corresponding brightness for different recipes. However it is easy to transit between one recipe to the other. 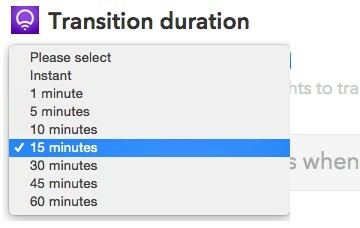 Here the Transition Duration shows the amount of time it will take to shift between recipes. Choosing instant will cause the bulbs to fade across colors that you change using the app’s color wheel. All the above setting mentioned are for the recipe below. 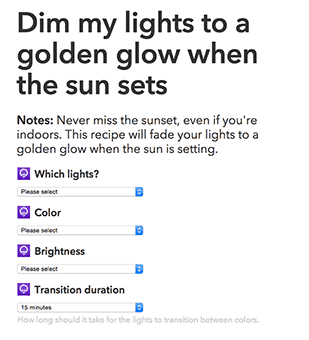 Click the image to navigate to IFTTT.com for selecting your own bulbs during sunset. Once you get familiar with using the basic of IFTTT Integration with your LIFX bulbs, you can think of several new possibilities of creating your own smart world around you.